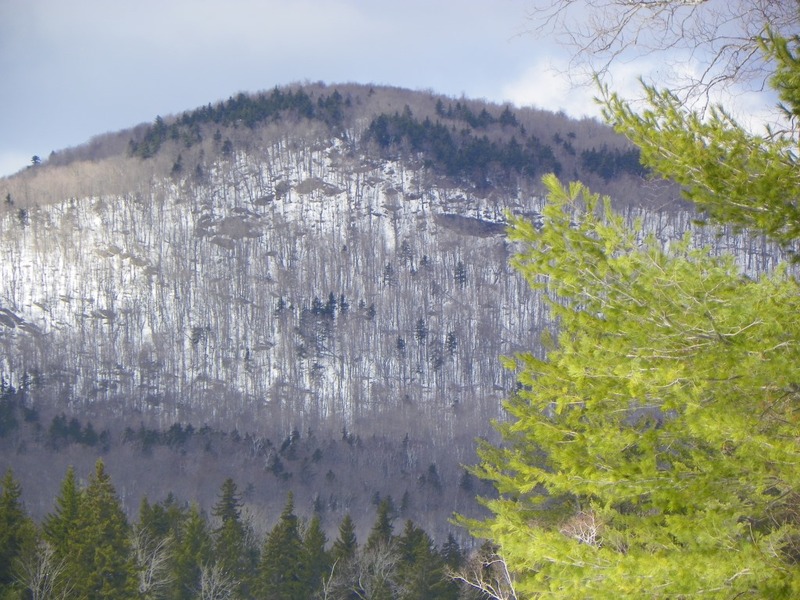 The beginning of spring in these parts was marked by a storm that dumped more than a foot of new snow. Winter’s keen, cold edge might have been worn down but her message remained blunt. The temperature dropped, the sap ceased running and it seemed for a few days that ours was the grumpiest village in the world. It’s not often people admit out loud that they wish it was mud season already. Their wishes have been granted and, while it may be too soon to tell for sure, this year’s mud looks to be at least average. Mud season takes some by surprise, especially those who recently moved here from other places looking for the “rural chic” of catalogs and magazines. 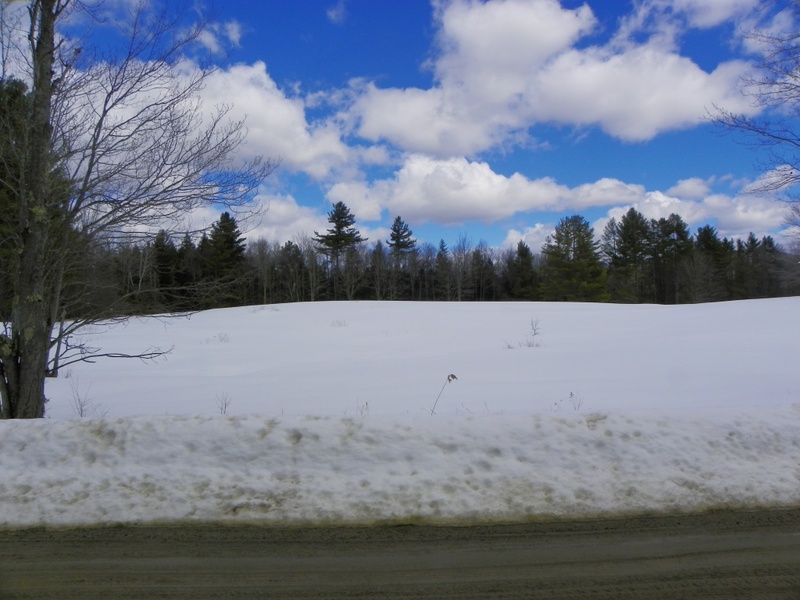 If a full Vermont winter didn’t do them in they must be sorely disappointed when March rolls around and tosses chic in a ditch, leaving them with only the rural. 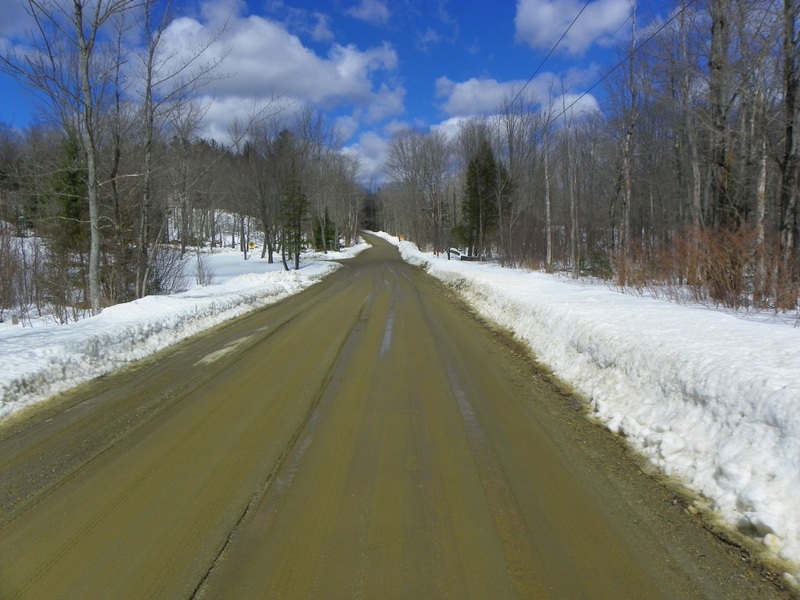 If there were a way to keep dirt roads dry in the spring I’m sure a Vermonter would have figured it out by now, but mud season is such a part of Vermont’s culture that maybe someone’s just keeping it a secret, so as to not spoil the fun. The Town Road Crew does not need your calls in order to know your road is muddy and your complaints are just as likely to be addressed if you shake your fist and shout them at the sky. Mud season teaches acceptance and humility, lessons you’ll be needing in a month when the black flies are looking to incorporate you into their food chain. Mud season’s just started, so either tuck your britches into your boots and stop driving so much until things dry out or slap ‘er into low gear and maintain your momentum. Those stories of missing horses and cars are not exaggerations by much. 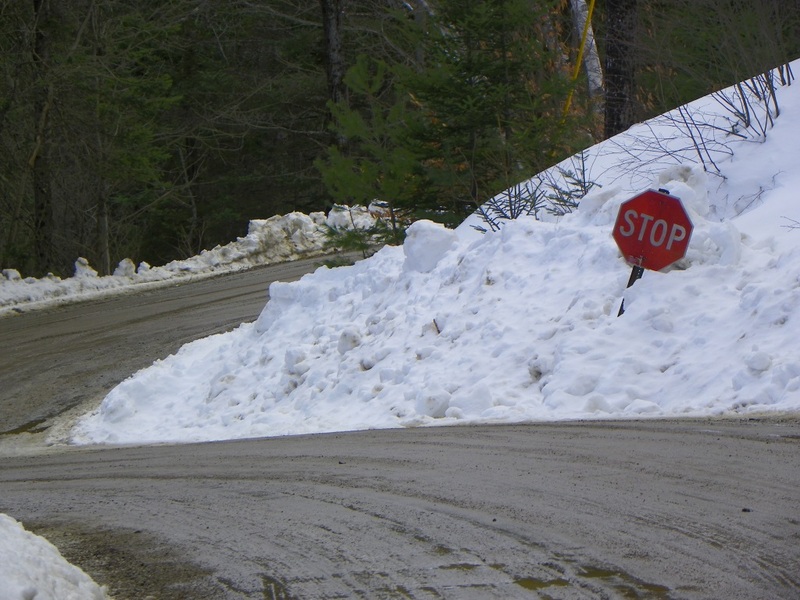 Snowmobiles can travel faster than cars right now, but not for much longer. 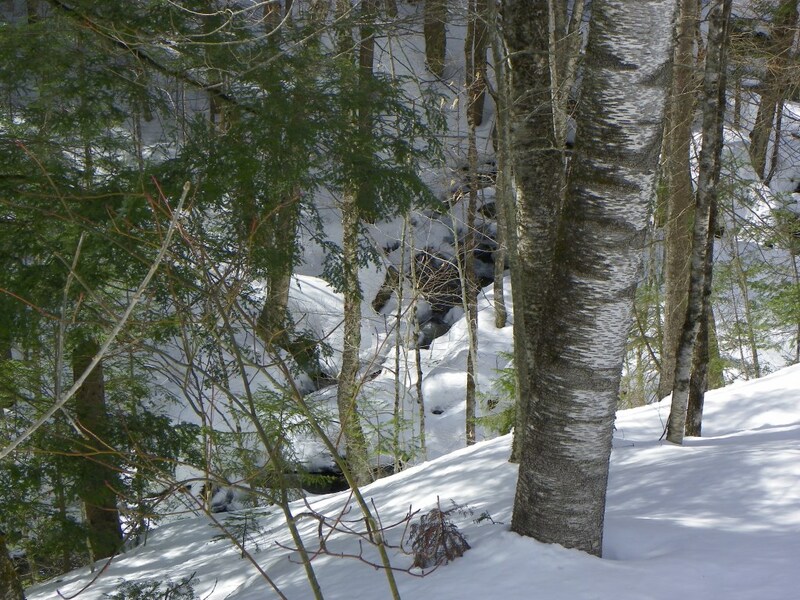 An important part of the winter-time economy, they travel mostly on trails maintained by the Vermont Association of Snow Travelers (VAST), subject to the rules of the towns through which they pass. 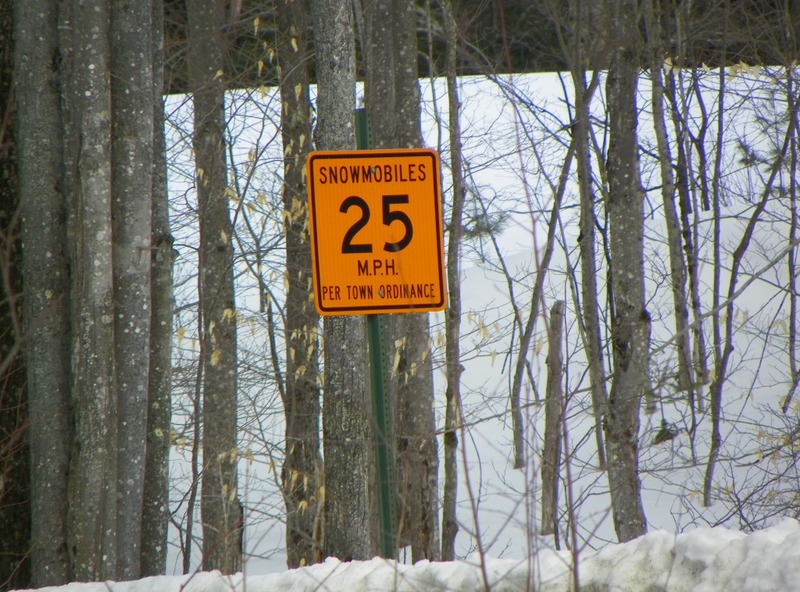 Trail crossings are well marked with a variety of scaled-down, snowmobile-sized signs, such as the one at the back of this photo, warning that skiers also use this particular section of trail. Poor little dude looks like he’s running for his life. 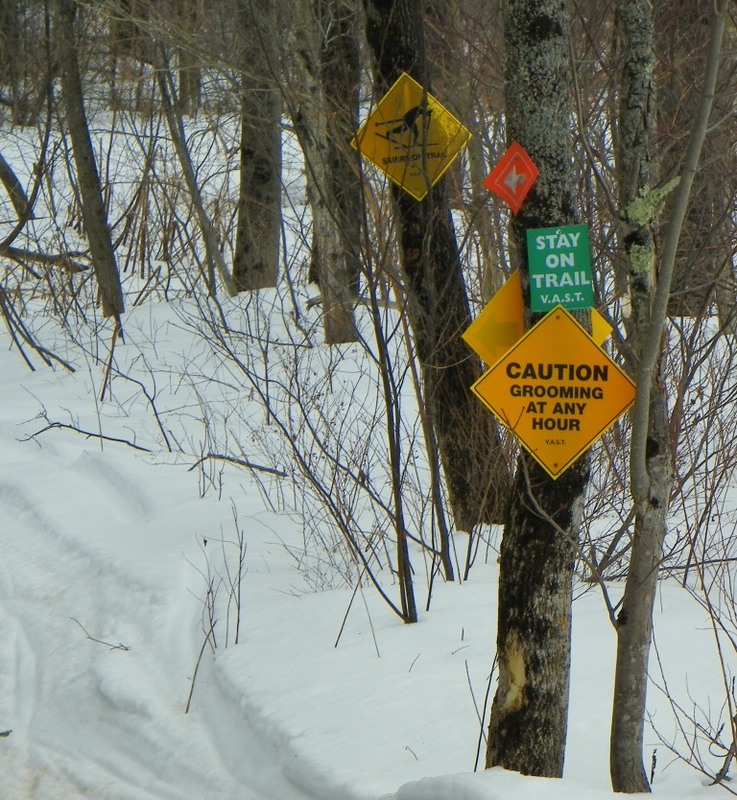 Strategically placed trees aid in keeping sledders on the trail in case signs don’t do the trick. The sign suggesting random grooming was appropriate last week as I chose, for no particular reason, at 2:30 p.m. on March 25, to shear off my winter’s growth of chin whiskers. Boiling (after shaving) allowed the recovery of close to a pint of dribbled Vermont Fancy Maple Syrup, but the flavor was off, with notes of ketchup, grape jelly, and who knows what all else. 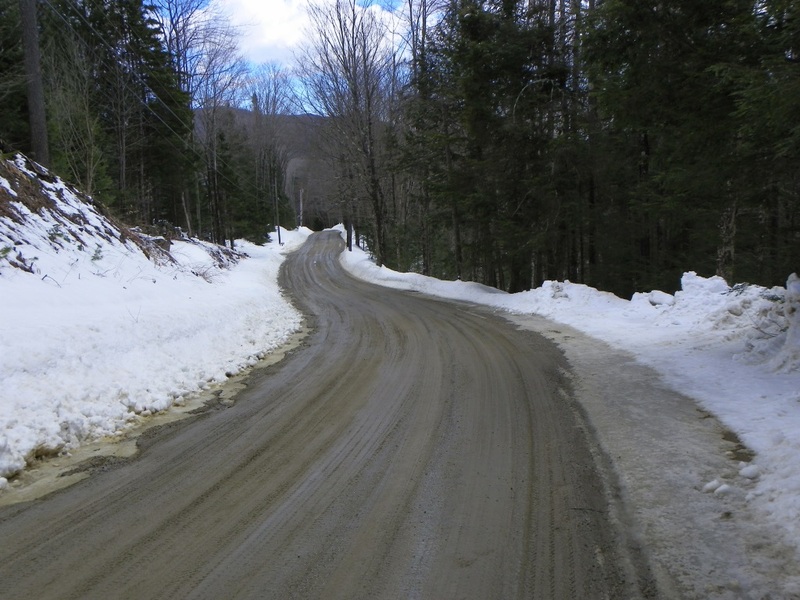 Muddy roads and my bare chin are not the only signs of spring in this neck of the woods, despite the deep snow that remains in the shady spots. 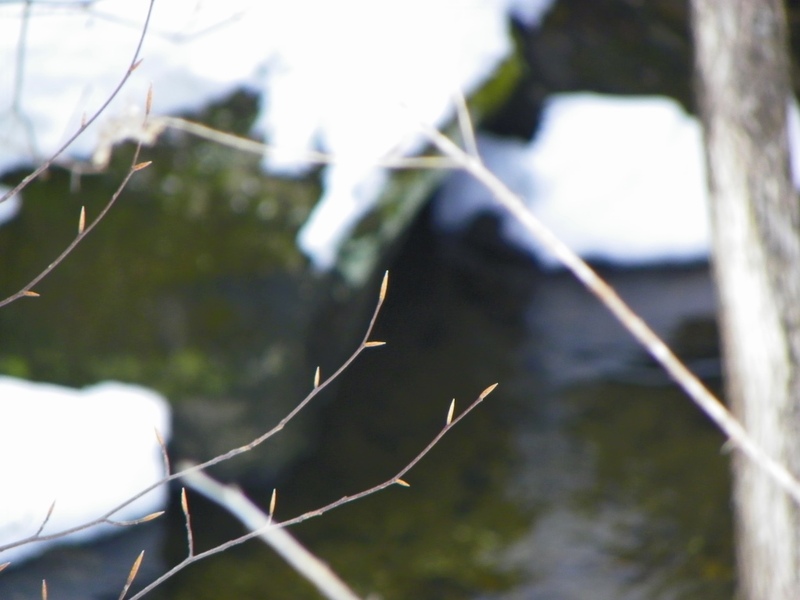 Buds swell and water runs along the stream bottoms as snow melts from the sun-warmed rocks on the high hills. Red winged blackbirds once again trill from the willows and robins dash across what bare ground they can find. Disappointed geese wait on the river for the ice on the lake to go out, but for all intents and purposes they have returned. 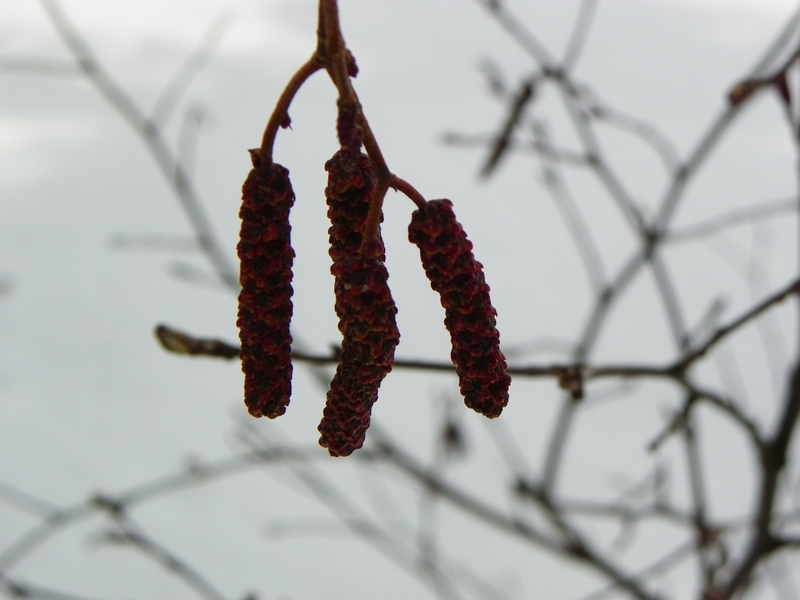 Even the alders have begun to bloom. My face is cold and the birds are slowly returning, the mud is back and so are the pollen counts, all sure signs of spring. But of all the signs, perhaps the most momentous return is that of the sign at the bottom of the hill. I purchased some Vermont maple syrup recently with a rather earthy almost muddy aftertaste. The wired hairs added a unique texture to my pancakes. Sorry for your winter suffering. I hope spring will come soon for all you hill toppers. Come on down to ct the striped bass fishing will be rockin soon. I hope you have learned your lesson about any liquid labeled “Private Reserve”. Like so many other things, winter is what you make it so I don’t consider it suffering. I’ve gotten to where I actually kind of like mud season. Don, what was left of that stuff boiled off at about 170 and disappeared in a big blue flash. Thank god for mud season and slow-melting snows: nature’s great leveler for New England romanticism. Without them you’d probably be living in the Poconos! Pavement is overrated and a good mud season must be seen to be believed. The cars of the weekenders were is pretty rough shape when they headed home on Sunday and I can only imagine the conversations at the office in New Jersey this week. Green things have been hard to come by in my neck of the woods. I think finally this week that will start to change. I like that last shot. Reminds me of my one venture out to Stinson Beach, north of San Francisco. Hairpin turn at the top, quite a number of cars dating back over 75 years 100 yards down below. I guess we’re turning the corner, but each day brings different conditions. Sliding on mud is different than sliding on ice but at least the snowbank offers a little cushion. Hard to find anything wrong with mud season if you can take advantage of it- as you mentioned, it is the black flies that can drive me under water. One nice thing about all the visitors coming in a month is that the black flies will be attracted to the new blood and I can stand there, all stoic-like, pretending they (the black flies) don’t bother me.